This is a fantastic cup holder. The center plastic ring lifts out to fit my mug in the most perfect way. 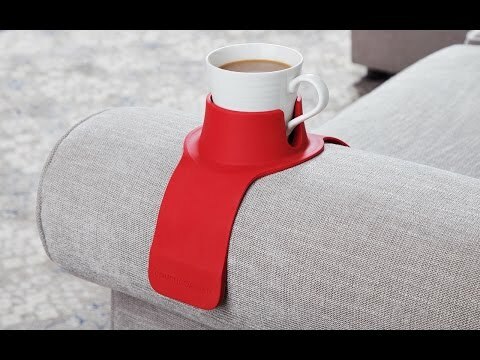 It is made of silicone so it never slips off the sofa and holds the cup or bottle in place snuggly. The only caveat is that it leaves an impression on the arm of my leather recliner over time. It is weighted so I truly understand that it will do this to softer, finer leathers. I don’t care though. It functions too well to even take it off, I’m going to keep it right where it is for the life of my sofa. Heck, maybe even the next one too. I purchased for myself and as gifts. We all use them daily. 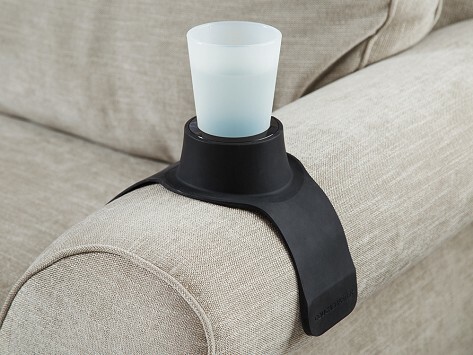 Limited table options and these are perfect for having drinks close and secure. I had got them for my husband and my son-in law saw them and I had to give him one, That's how much it was liked.